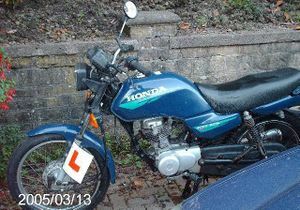 An electric start was added in 2001, originally alongside the original Kick start and replacing it completely in 2004. This last change is one of the very few changes that sacrificed functionality in favour of aesthetics. The CG125 is powered by a very fuel efficient 124cc single cylinder 4-stroke OHV engine that has changed little over the years. With careful use, it is quite capable of achieving more than 100mpg, and over it's comparatively long history the CG has earned itself as a reputation as a "bullet proof" machine. 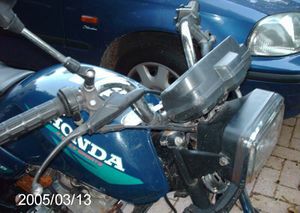 Due to its design success, several direct copies of the CG125 have sprung up (mostly from Chinese and Korean manufacturers), such as the Hongdou CG125, the Champ Commuter, the Warrior Dispatch and the Kymco Pulsar125. 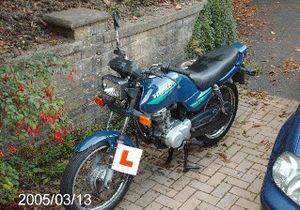 In Brazil and in the UK, it is easily the most widely used beginner motorcycle by training schools. 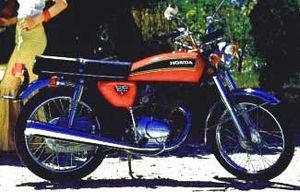 Honda CG125 was not sold in the USA or Canada. The tank design is like the 1974 models. This page was last edited on 28 November 2010, at 20:57.